There was a strong message from tonight’s show that audiences can be built in venues outside an artist’s hinterland. 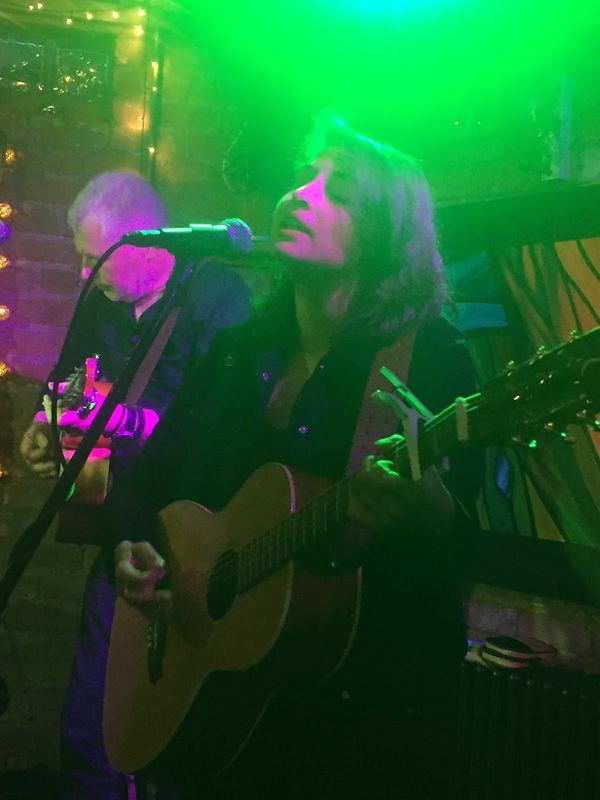 Bedford based singer-songwriter Danni Nicholls took a chance on booking a show at Birmingham’s Kitchen Garden Café twelve months ago with this subsequent return visit yielding a substantial upgrade in attendees. Danni knows full well the value of organic growth and this turnout was a testament to the absolute quality of her music. Word must have obviously got around and importantly the new album has been bedded in since getting a formal release in October. Numbers aside, catching Danni live is a worthwhile investment of your recreation time especially if you like a little edge to elaborate well-crafted songs. Apart from the audience size upgrade, Danni’s stage show has doubled in number with the addition of Max Milligan on lead guitar, providing a twin acoustic assault on a set of tunes rich in roots pedigree. Although Max did partner Danni on a lower key visit to the area towards the end of last year, this was a debut performance on the Kitchen Garden Café ‘stage’ and the positive impact was explicitly on show especially for the few who attended both Birmingham gigs. Like her previous shows in the area, this one panned out as a twin set evening with Danni drawing songs predominately from her two full length albums. The odd three songs out were two covers and hark back to her EP days via a version of ‘Between the River and the Railway’. This song was one of many to have a story attached to it with this tale not heard before and recounting a camping experience on a trip to North Carolina a few years ago. The other key story from Danni’s set was recalling the origins of ‘A Little Redemption’ and the link to the Women’s Institute, plagiarism and a tiny village in Suffolk. This song rose to become the title track of Danni’s previous album and retains a place among the elite of her compositions. As you would expect, there was a major focus on the new record and MOCKINGBIRD LANE, like its predecessor, had the full Nashville recording treatment. This is indicative of Danni’s Americana leanings and how she successfully weaves the sound of country, blues, folk and soul into her music. Her choice of cover reflected this mix by announcing ‘Jolene’ is probably her favourite all time song and that she was mesmerised by the Bonnie Raitt version of the Randy Newman song ‘Guilty’. Hasten to add, Danni’s rendition of both was pretty good. Like the success of all singer-songwriters, it is the appeal of the original tune which acts as the defining judgement and Danni shapes up well against the criteria. ‘Leaving Tennessee’, ‘Back to Memphis’, ‘Beautifully Broken’ and ‘Travelin’ Man’ represent the best of Danni Nicholls, with the first of these launching the slightly more effective second set and the last one acting as a suitable upbeat encore piece. It is not unusual for a gig at this level to take a few songs for the artist to get into their groove and once Danni hit the zone there was no stopping her. The chemistry between Max and her is growing with his highly pleasurable guitar playing delivering some jaw dropping moments. Danni’s vocals continue to blossom as best exemplified by the regular slot when she drops the guitar to let her voice rule the roost to perform the sensually impressive ‘Look Up at the Moon’. The pick of the rest is the sole song on the new record that she didn’t write, but many on the Nashville scene praise the work of Will Kimbrough and ‘Goodnight, Moon’ was a smart song of his to include. It was of no surprise to listen to Danni accept the critical view of the latest record as a break up album, but she counter balanced the emotions by playing a love song from the previous one in ‘Dragons in the Distance’. It’s been a hectic time for Danni Nicholls as she plies the lone trail of intensely promoting an independent record, though she has now announced a tie up with the Brighthelmstone/BPA Live teams for additional support in growing her audience via connective activities. The product is in place, although sadly that is often not enough in these cut throat and cynical times. Moreover the success of Danni is secondary to the excellent music she makes and this hugely talented singer-songwriter will continue to be a vital member of the UK independent roots community for many years to come. This Kitchen Garden Café show was a signal that endeavour can pay off.